Babyloid is a robot created in Japan by Masayoshi Kanoh, a professor at Chukyo University in Nagoya. This robot can help the elderly fight against their isolation. Japan is a country with one of the world’s lowest birth rates and the population growth is negative. However, most women in Japan live record long lives. Hence, it is becoming important to protect such aged persons against the depression associated with loneliness. . In this context, in recent years, Japan has decided to focus on development of robots for the aid and assistance to the elderly. The research programs launched in this regard have started to show some promising results. This is the case of Babyloid. 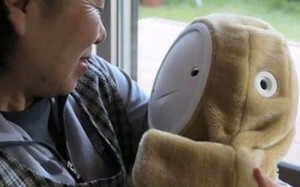 It is a small teddy robot that will give elderly company and keep them protected them from isolation. The teddy robot has a big round head with a soft and stylish face made of silicon. The face has two eyes (two black dots that can blink) and a mouth that can smile. The cheeks of Babyloid turn red when the robot is “happy” and turn blue when it is “unhappy”. Finally, this robot is also capable of playing hundred different sounds recorded from a real baby.The idea is to make the elderly interact with the robot. For example, if they console the robot when it is crying, it will sleep. According to experimental studies in a Japanese nursing homes, the presence of Babyloid reduces the depression of the elderly residents. However, one big problem remains. This robot currently costs 20,000 euros. However, the product designers expect with mass production the cost will be drastically reduced.